Sonic the Hedgehog is a video game for the Xbox 360 and PlayStation 3 that was made to celebrate the 15th anniversary of the Sonic the Hedgehog franchise. It was developed by the Sonic Team and directed by Shun Nakamura. 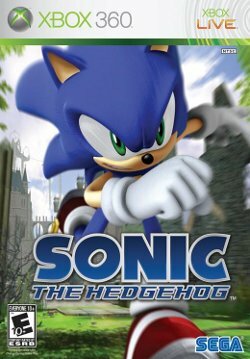 The game shares its name with two earlier video games, a manga, a television series, a comic book series and, of course, Sonic the Hedgehog himself. To disambiguate, the game has been called by a number of different aliases, including Sonic 2006, Sonic '06, Sonic 360 and Sonic Next-Gen. Xbox Live solves the problem by referring to it in all-caps as SONIC THE HEDGEHOG. This is the second Sonic the Hedgehog game to get an E10+ rating by the ESRB, the first being Shadow the Hedgehog. Other content rating organizations agreed with similar ratings. The PEGI rating is 12+, while the CERO rating is A. This game marks the first appearance of Silver the Hedgehog, from Blaze's future, as well as the return of Blaze the cat from Sonic Rush. This is also the first game that uses the same voice actors as the anime Sonic X, different from those used in previous games. Although each character plays the same levels, each character's unique abilities allow him or her to get to different areas of each stage, and deny them from accessing certain items. Gameplay is broken up into two gameplay styles, similar to the original Sonic Adventure: Action Stage and Town Stage. Action Stages are primarily where the bulk of the gameplay takes place, whereas Town Stages are free-roaming locations where the player can talk to non-player characters and explore, similar to Sonic Adventure's Adventure Fields. For each of the action stages in the respective stories, gold medals are obtainable by achieving high ranks in these stages. There are a total of eleven stages. The ranking system in the game for each of the levels (and even the town missions) is similar to Sonic Rush, providing score ranks with the highest rank revealed to be S Rank. The lowest is D Rank, unlike previous Sonic games where the worst rank was E Rank and S was the highest (Save for Sonic Riders, where C was the lowest and X was the highest). The Havok Physics Engine is also used, giving robots and debris realistic physics as objects crumble, fall, and bounce around the playing field. The basic features of previous Sonic games return; classic objects like springs and dash plates, as well as newer features such as rail-grinding, sliding, and the homing attack. All of these are shown in the demo. New elements include catching a ride with an eagle, grinding on a jet stream of water, and using spring ropes to proceed to the next area. While there is still debate over the validity of the claim, an old issue of GamePro once stated that the smoothest character models in previous Sonic titles were constructed with about 1,500 polygons, and that player models in this game "will be composed of over 1 million polygons each". By default, the camera is closer to Sonic, and lower to the ground than the previous Sonic games, to help emphasize the sensation of speed. Rings have expanded functionality. Rather than simply being a measure of life, they can now be used to purchase items and abilities in the Town Stages. Sonic does not always lose all of his rings when he is hit in this title. Depending on how he is attacked, he loses either one ring or all of his rings. When playing through action stages and town missions for the first time, the higher his rank, the higher the number of rings earned. On September 4, 2006, Sega announced they would be working with Kynogon to license their Kynapse Artificial Intelligence Middleware. The game supports content download from Xbox Live (X360) & PlayStation Network (PS3). Currently, the only available downloads are the Very Hard Mode option, which must be purchased separately for each of the three playable characters , and the "Team Attack Amigo" option. Also, you have to beat all missions for some Very Hard stages. This page has been accessed 24,365 times.